Apple just revealed its new iPads a day early. 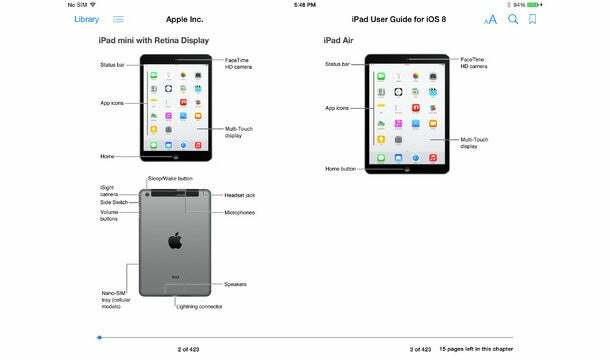 Well, not exactly, but screenshots of the new devices appeared in its iOS 8.1 iPad user guide within iBooks on Wednesday. Considering Apple's event is not until Thursday, the posting looks to be an accident on Apple's part. Originally reported by 9to5Mac, the screenshots also confirm some of the rumors that have been circulating about the expected devices. The new iPad Mini will be called the iPad Mini 3 and the new regular size iPad will be called the iPad Air 2. Both devices will also feature Touch ID and the iPad Air 2 will have the Burst Mode feature, which allows the user to take multiple frames per second. While not confirmed by the screenshots, industry experts told CNBC that it's also possible the company will show off a new iMac at the event as well as announce an official launch date for Apple Pay. CNBC reached out to Apple for comment about the posted images, but has not yet received a response.